It's finally here! 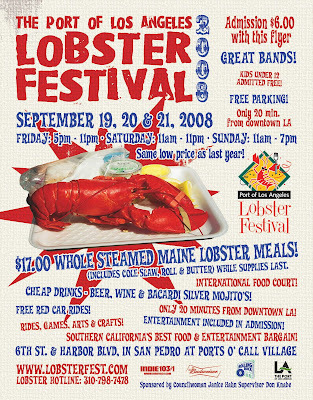 If you are a lobster enthusiast like myself, you need to head on down to The Port of Los Angeles Lobster Festival in San Pedro. It features fresh discount Maine lobster meals and plenty of entertainment. You can enjoy great shopping, dancing, parades, street performers, a pirate camp, and musical performances by The Henry Clay People, The Binges, Weather Underground, Soul Missive, and Common Sense. Kids under 12 admitted free!